Global aggregation and distribution doesn’t need to be complicated. Walla’s proprietary tools leverage technology to solve common VOD pipeline issues and reduce the costs associated with platform delivery. Our Studio Services dashboard was designed as an end-to-end solution to bring efficiency and accountability to our content partners. No hidden fees. Walla charges a low, one-time fee for iTunes delivery and a performance-based revenue share so you always know the cost of your iTunes distribution. With automated monthly funds transfers, filmmakers get paid quickly and regularly. Walla offers transparent sales reporting & streamlined payment processing. Revenue is delivered consistently, on time, and never held or paid in arrears. 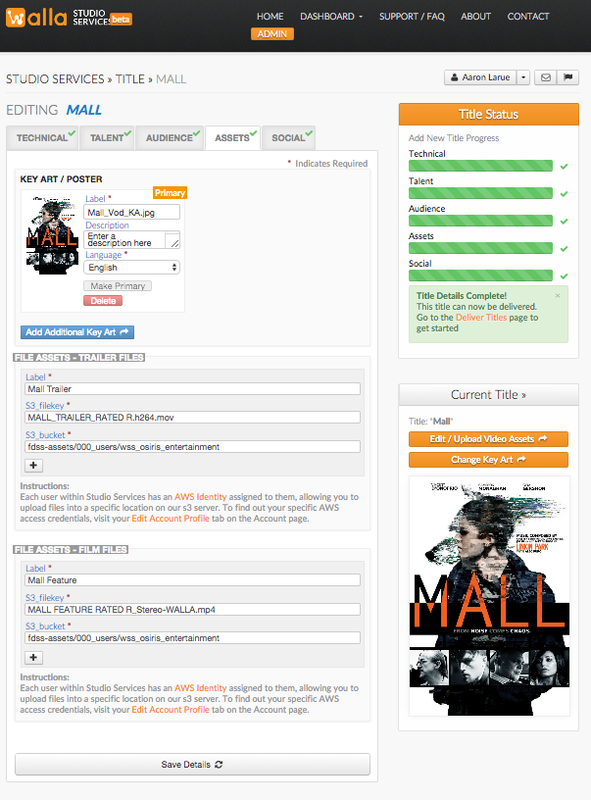 No need for film labs or hard drives, Walla offers a painless, guided asset upload tool. With real-time feedback, our content partners know what information has been received, what is outstanding, and how close a title is to delivery. Walla saves the information for each title in our secure cloud. Provide your assets and metadata once and we handle the rest – pricing updates, street date changes & additional territory deliveries happen at the click of a button. Our partners always know how their titles are performing across the iTunes ecosystem. Real-time sales reporting means trust and accountability, which lets us focus on working together to maximize sales.